To begin with, I am sure that all of us make a lot of spelling mistakes and grammatical errors while doing some assignment, project etc. on our systems. This is something that is inevitable and all of us are guilty of. These mistakes, or silly mistakes I should say, can also be a little irritating sometimes. To save you this irritation, I have come up with these 5 free spell check software that help you out in such situations. These software support different languages and work with different applications on your system. So check them out and install your favourite ones on your desktop. The 5 free spell check software that I have reviewed here are Ginger, TinySpell, Language Tool, Spell Checker, and Free Spell. The first free spell check software in this list is Ginger. The software has a very stylish interface and some useful features. The software has two versions. One is basic and the other is the paid version. The free version of the software works with PowerPoint, outlook, MS Word, Internet Explorer, and Mozilla Firefox. You can switch between US English and British English. These are the only two languages that the free version supports. Another feature is that, it not only corrects spelling but also detects Grammatical errors and rephrases the sentences for you. To use Ginger, you have to place the cursor where you want to perform the spell check and press the assigned hotkey. The software will provide all the available corrections and you can approve the one you want or simple skip it. Overall, Ginger is a decent software with a very stylish interface. I just wish that the free version could support Google Chrome as well. The second free spell check software is TinySpell. It is a very lightweight software that runs from the system tray of your icon. It is compatible with all the applications, browsers and supports only English Language. 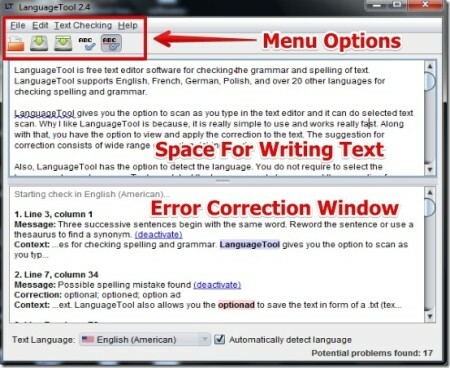 To check the spelling using this software, you have to copy the text that you want to check and copy it. The copied text will automatically open in a small window. There will be a small beep if the copied text has any spelling or grammatical error and the software icon will turn yellow. 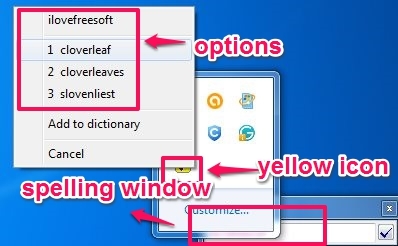 To look for correct options, you can either right-click on the icon of the software or press the assigned hotkey. All the option will appear and you can choose the right one from them. The software also allows you to edit its dictionary and add your own words to it. The third free spell check software is Language Tool. It is a very easy to use software that works really fast and efficiently. The software detects all your spelling mistakes, grammatical errors, capitalization etc automatically. 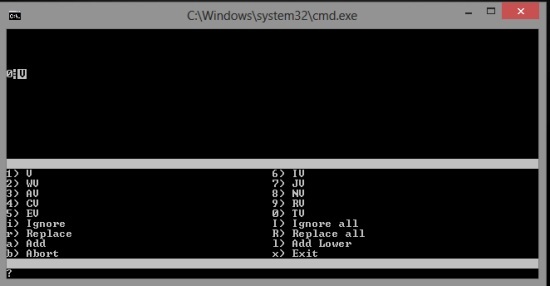 After downloading the software, you have to start typing your text on its interface, or paste the text from somewhere. It will automatically detect the errors as you are typing, and highlight them in Red color. A very important feature of this software is that it supports 20 different languages. You also do not have to select the language every time as the software automatically detects the language you are typing in. Next free spell check software is Spell Checker. The software is very much similar to Language Tool, apart from some of the features. You have to type or paste the text on the interface to check for errors. After you have written everything, hit the start checking button and the software will do the rest. The errors will be highlighted one by one and you can look for the correct options in the suggestions window. The software has a very rich dictionary and you have the option of inserting your own words in it. After you are done checking for errors, just hit the copy button and paste the error free text in any application you want. 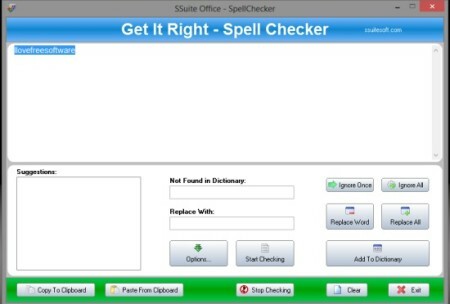 The fifth and final free spell check software is Free Spell. It is a command based software and works very efficiently. You have to begin by setting a hotkey. Whenever you have to check for errors in a text, press this hotkey. After setting the hotkey, just minimize the window and start using the software. You can select the text that you want to check, in any application, and press the hotkey. A new window will open up in which you will find all the errors and correct options. You can press the provided command key and correct all the errors in the text. Free Spell is a simple to use and a very lightweight software. So, download the above provided free spell check software and throw out all the irritation of correcting your mistakes manually.